Japanese Culture: The Religious and Philosophical Foundations takes readers on a thoroughly researched and remarkably readable journey through Japan's cultural history. This much-anticipated sequel to Roger Davies's best-selling The Japanese Mind provides a comprehensive overview of the religion and philosophy of Japan. This cultural history of Japan explains the diverse cultural traditions that underlie modern Japan and offers readers real insights into Japanese manners and etiquette. 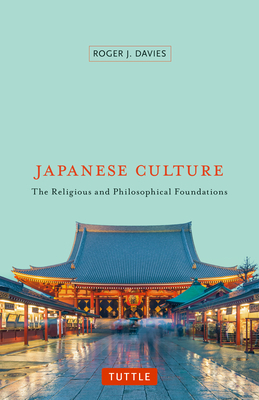 Davies begins with an investigation of the origins of the Japanese, followed by an analysis of the most relevant approaches used by scholars to describe the essential elements of Japanese culture. From there, each chapter focuses on one of the formative aspects: Shintoism, Buddhism, Taoism, Zen, Confucianism, and Western influences in the modern era. Each chapter is concluded with extensive endnotes along with thought-provoking discussion activities, making this volume ideal for individual readers and classroom instruction. Anyone interested in pursuing a deeper understanding of this complex and fascinating nation will find Davies's work an invaluable resource. Roger J. Davies is a committed advocate of lifelong learning with degrees in Linguistics (M.A. Ph.D.) and Business Administration (MBA) from universities in Canada, Great Britain, and the United States. He has taught courses in business management, intercultural communication, and Japanese culture at both postgraduate and undergraduate levels at some of Japan's leading schools, including Hitotsubashi University, The University of Tokyo, and Waseda University. He is also the lead editor of bestselling, The Japanese Mind: Understanding Contemporary Japanese Culture.